A detector at the Large Hadron Collider is regarded as a "lower priority"
Physicists and astronomers have three weeks to make the case for a number of high-profile projects at risk of being cut from the UK's science portfolio. The lists of facilities and experiments include spacecraft, telescopes and hardware for particle accelerators. The scientific worth of each is being assessed as administrators seek to plug an £80m hole in their finances. A decision on their fate will follow the period of consultation and is expected by April 2008. "Every single programme we looked at was worthwhile - there was not a dud amongst them," Sir Peter Knight, head of the panel which compiled the lists for the Science and Technology Facilities Council (STFC), told BBC News. However, the STFC, which looks after some of the largest science centres in Britain, cannot fund all of the projects it is currently committed to after an unfavourable government spending review last year. Projects under threat include an upgrade to the Merlin radio telescope array (e-Merlin) at Jodrell Bank and the UK infra-red telescope - the world's largest telescope dedicated to infrared astronomy, based in Hawaii. To decide which STFC projects and facilities are priorities, Sir Peter and other advisors were asked to draw up two lists - split between particle physics, astronomy and nuclear physics (PPAN), and physics and life sciences (PAL). PPAN projects include telescope arrays, upgrades to particle accelerators and robotic space missions such as ExoMars. PAL projects include upgrades to the Diamond Light Source synchrotron. "We had to make difficult choices," said Sir Peter. "There are imaginative people who have put their careers on the line for these projects and they are good projects." "High priorities" such as Venus Express and the gravity wave detector GEO 600 are likely to be safe from cuts. However, 29 lower priority projects, which include UK involvement in the ALICE experiment for the Large Hadron Collider (LHC) particle accelerator, which comes online later this year, could be at risk. ALICE - a large ion collider experiment - will study high density matter. Some scientists believe the list has been fudged and that certain areas of science have fallen through the net. For example, all ground based solar terrestrial physics facilities have been earmarked as "lower priority", described by one researcher as "absurd". In addition, professional bodies such as the Royal Astronomical Society have challenged the classification of certain projects, such as UK involvement in the Hinode space observatory and the upgrade to Merlin, as "lowest priority". The reason for these oversights, some researchers believe, was that the STFC advisory boards were too small (the PPAN board consists of eight people) and therefore did not represent every area of science they were making decisions about. Scientists now have three weeks - thought to be too short a time by many in the community - to submit evidence to a consultation in an effort to boost their project above the cut-off point. Any submission will be reviewed by a series of panels set up to assess different disciplines. "A whole part of the consultation exercise could be to reveal something that we've ignored or neglected - in which case we better change our minds otherwise there is no point having a consultation," said Sir Peter. Some projects have already secured funding, saving them from the cuts. 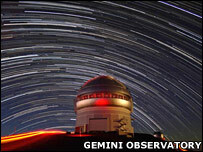 For example, the Gemini observatory appears as a lower priority on the list. However, following negotiations last week, UK astronomers once again have access to two of the world's best telescopes. "It would have cost us money up front to withdraw," explained Professor Walter Gear, who led the PPAN assessment. "If we can continue doing excellent science on Gemini for the same funding - the same amount of money - as it would have cost us to withdraw up front and lose all that science then clearly we are going to remain in Gemini." The STFC hopes to recoup some costs by selling observing time. If it does not, funds for Gemini will have to be taken away from other projects. An instrument for the Mercury probe Bepi-Colombo also appeared as a lower priority. But a deal signed with the European Space Agency (Esa) meant there was "no credible option for withdrawal". Examples such as this have led to accusations that lower priority projects are being funded ahead of higher priorities because of existing agreements rather than because they will deliver the best science. "Given that we have such a huge problem we have to consider stopping things that are already funded and Bepi [Colombo] is one of those," said Professor Gear. "However we have made an existing commitment which cannot be reneged upon and so it has to continue to be funded. Similarly with Gemini." STFC is seeking money from external sources for other "low priority" projects such as the e-Merlin project at Jodrell Bank. The council is in discussions with the Northwest Development Agency and Manchester University about how best to fund the expansion. It is also seeking international partners for UKIRT but has warned that if they fail to materialise "closure would have to be considered".